A senior official of the Israeli embassy in Georgia Harry Cleman–who arrived in Yerevan on Tuesday–dismissed press reports which claimed that Israel was selling military hardware–100 tanks and 30 military aircraft–to Azerbaijan. Meeting with local reporters–Cleman’said that these "absurd" reports were disseminated with one goal- to harm development of Armenian-Israeli relations. "No such deal was ever concluded and is not foreseen in the future," he said. In response to a question whether Israel was planning to open its embassy in Armenia–Cleman’said it depended on Armenia. 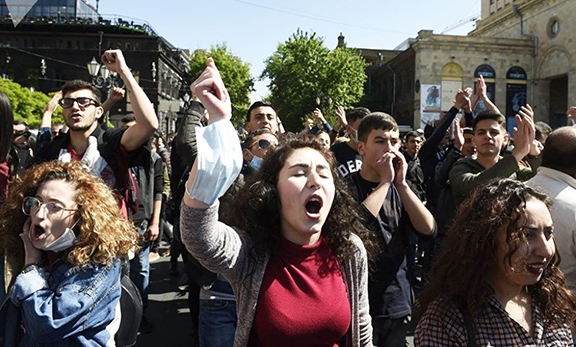 "The day after Armenia opens its embassy in Israel–we shall open ours in Yerevan," he said. According to him–the issue of the Armenian Genocide should be left to historians and making it a priority of Armenia’s foreign policy–hinders normalization of Turkish-Armenian relations. Regarding the Karabakh conflict issue–Cleman’said that peace can only be established through peaceful negotiations and compromises made by both countries. He also said that Armenian-Israeli relations begins with the cooperation between Israeli and Armenian non-governmental–cultural–and intellectual organizations.